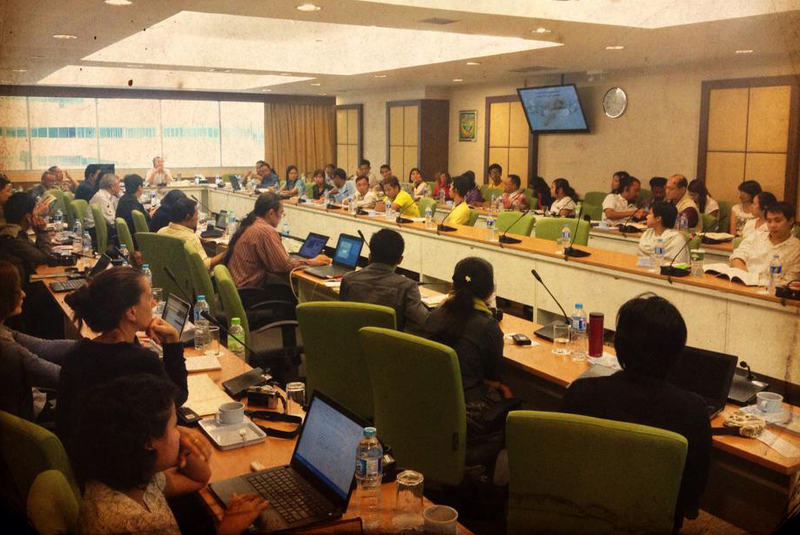 Bangkok, Thailand – Community representatives from areas affected by the Dawei Special Economic Zone (DSEZ) questioned today how the mega-project could go ahead when so many social and environmental impacts and human rights violations have already taken place that have not been addressed. These problems need to be resolved first, before considering a new phase to this already problematic project. “When the road construction came to my village we didn’t know anything. We have lost our farmlands, our clean water and our livelihoods… but received no compensation. They did not tell us all the problems that the project would bring,” said Saw Keh Doh who has travelled from Thabyuchaung village in Dawei District of Myanmar to Bangkok to present his concerns to the National Human Rights Commission of Thailand. “We need information, we need to know exactly who will take responsibility, what will be done to remedy the existing problems and how those responsible will protect against further negative impacts,” said Daw Su Su Swe, from the Tavoyan Women’s Union. The communities’ concerns are documented in a new report by the Dawei Development Association (DDA), entitled “Voices From the Ground: Concerns Over the Dawei Special Economic Zone and Related Projects,” released today at the Foreign Correspondents’ Club of Thailand (FCCT) in Bangkok. The report was also presented to the National Human Rights Commission of Thailand in a public hearing at the Government Complex. The report calls on the National Human Rights Commissions of Thailand and Myanmar to collaborate and carry out a full investigation into all complaints of human rights abuses, relating to land confiscations and forced evictions as a consequence of the Dawei SEZ project activities or operations conducted by companies domiciled in Thailand or Myanmar. DSEZ is located in an agricultural, coastal region of southern Myanmar. First initiated in 2008, it will comprise, among other components, a deep seaport, an industrial estate, a water supply reservoir, and a road link between the two countries. If completed, it would become one of the largest industrial zones in Southeast Asia. The Italian-Thai Development Company (ITD) was responsible for the operation of the projects from 2008-2013. Stalled since November 2013 due to lack of finance, direct responsibility for the project was transferred to a Special Purpose Vehicle (SPV) owned by the Thai and Myanmar governments in equal shares. After the recent visit by the Thai Prime Minister, Gen. Prayuth Chan-ocha to Myanmar, both governments have indicated that new investors have made bids for the project but very little information has been made available to the public. There is a fragile political context in both countries, particularly in the border areas of Myanmar that are under the control of armed groups. “Are investors fully informed of the risks? And do they realize the full extent of their environmental, social and human rights responsibilities?” said Saw Kho, from Community Sustainable Livelihoods and Development (CSLD). compensation process. The report presents a series of recommendations to the major stakeholders, including the Thai and Myanmar governments, as well as to investors from Thailand, Japan, and elsewhere who may be considering investment in these projects. Furthermore, the report shows that already, DSEZ developers have not adhered to relevant international, regional, and domestic legal obligations, standards, and other responsibilities in relation to forced evictions, rights to adequate food and housing, and indigenous people’s rights. These gaps must be urgently addressed by the project partners. “It is the primary responsibility of the State to protect its citizens. If this project, that creates human rights violations and destruction of the environment and livelihoods of the people, will be resumed, both governments will be judged very harshly by history” said U Thant Zin, Coordinator of Dawei Development Association.